The Wahl 9854-600 Lithium ion trimmer is one of the very few trimmers in the world that use the superior Lithium ion technology which provides the trimmer with increased battery time up to 3 times the battery time of a normal trimmer. The trimmer comes with a lot of accessories that make it the perfect choice for an overall hair grooming device for men. The package comes with a trimmer blade, detail blade, dual shaver, T-blade, beard guide combs, T-blade guide combs, charger, cleaning brush, blade oil and an instruction manual that provides instructions in four different languages including English. 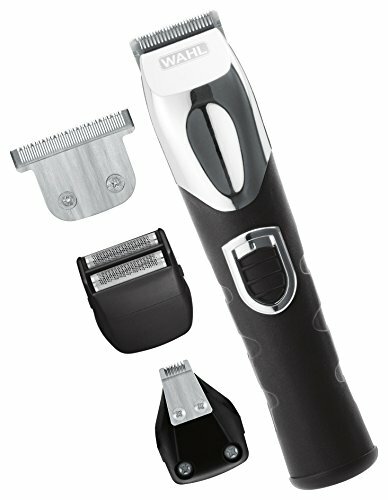 The Wahl Lithium ion trimmer comes with a lot of unique features that make it the perfect choice. The trimmer is very lightweight and comes with a new Lithium battery that lasts up to 3 times longer than a normal trimmer and this makes it very convenient as the charge level of the trimmer never reaches zero while operating. The charging time of the trimmer is also very low as it gets charged really quickly and can achieve full charging within one hour of charging. The trimmer comes with professional quality blades that make trimming of your facial hair very easy for you. The supreme quality of the blades also make the device very durable and long lasting and can last for several years without any major faults.The silicone grip gives great grip while holding the trimmer at critical angles which helps a lot in precise shaving. Precision features also includes trimming of nose hair and hair inside your ears which can be very difficult to trim with a normal trimmer but the Wahl Lithium Ion trimmer makes sure you don’t have to go through much trouble and can be very convenient.It also features a dual shaver that again can be very useful in precise shaving or shaving edges. The clipper blade included with the package also makes the device capable of normal haircuts required for proper grooming of your hair and it can save you all the money and time you spend visiting a barber to get your hair properly groomed. With this trimmer, it is very easy to give you a haircut of your own choice as it comes with different styled combs that provide different angles and several different positions to cut your hair and style it according to your requirements. It comes with a very powerful motor that makes trimming of your hair very efficient, easy and quick. It comes with a very powerful and long lasting battery that never loses charge while operating. The device feels very solid and is made of very superior quality material which makes it very durable and is expected to last years. The standard narrow blade provides very precise trimming for edges and most of the critical angles. 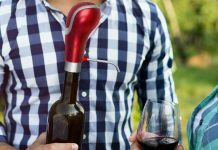 The device is very light weight and can easily be managed by any individual. The package comes with too many accessories that tend to make everything very complicated. The trimmer lacks a unique design and looks like a pretty ordinary trimming device. The standard narrow blade might provide precise trimming but makes trimming time consuming and it can take a long time for little amount of trimming. If you’re a guy who keeps on changing his facial hair design every once in a while and are in need of a trimmer which can help you keep up your unique beard designs then the Wahl Lithium Ion trimmer is the perfect choice for you as it will provide you with precise shaving to create new and unique styles and also last very long due to its increase battery timing. This device can also be very useful for people who tend to travel a lot as people who travel a lot require devices with long lasting batteries and this trimmer probably comes with the best battery timing as compared to any other hair trimmer in the world. Overall, the Wahl Lithium Ion trimmer can be a very useful product and can fulfill most of the everyday grooming needs of an adult and can make life easy for them at a very reasonable price. Several customers who have used this product reviewed it on amazon and out of all the reviews by different customers, the Wahl Lithium Ion trimmer received a user rating 3.8 out of my which is above average for a product of this nature. The customers praised the long lasting battery of the device and were quite pleased with how they don’t have to charge it every time before using it. However some customers complained a great deal about the speed of trimming as it was very below average as it took a lot of time to successfully trim even the smallest of beards. Apart from that, customers seemed very satisfied and were also very happy with the price of the product.